Click to Register and for additional details on this award winning conference. 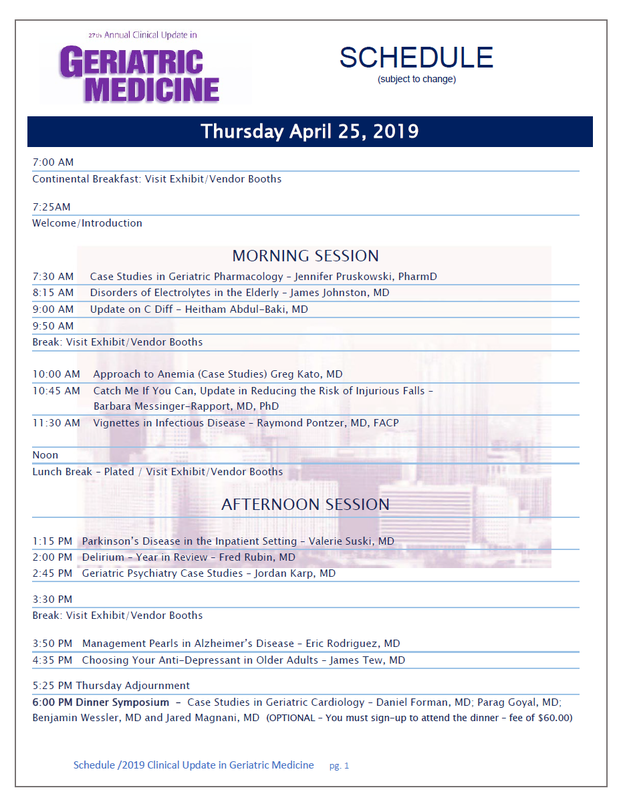 Locally, Mr. Paras and Ms. Oyefusi will be formally recognized at the 2019 Clinical Update in Geriatric Medicine dinner symposium, scheduled for April 25, 2019, where each will be presented with a certificate of excellence and honorarium. The honorarium will aid in defraying expenses to attend the AGS 2019 Annual Scientific Meeting to present their work. As a member, you are an integral part of the Society and aid in our efforts and mission: to EDUCATE, COMMUNICATE, and ENGAGE healthcare professionals (representing all disciplines) in the provision of quality healthcare for all older persons. Strengthen our voice and become a member today. 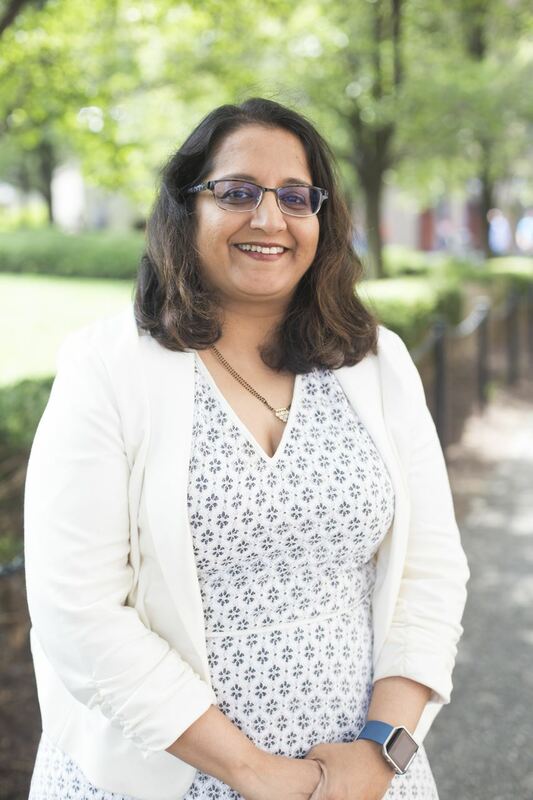 Namita Ahuja, MD, assumed the role of president of the Pennsylvania Geriatrics Society – Western Division (PAGS-WD) on January 1, 2019, serving a two-year term. Dr. Ahuja will oversee the Board of Directors, which is comprised of 17 healthcare professionals representing various disciplines and local institutions throughout the region. • Develop, support and promote the clinical practice of geriatrics and support practitioners who provide such care. • Increase the number of physicians knowledgeable about geriatrics and committed to the clinical care of the aged. • Engage with the American Geriatrics Society (AGS) on public policy efforts that will result in improved health care for older people. • Increase the membership base of the society, to foster and encourage active participation by its members and to serve the needs of the membership. • Develop and maintain productive and collaborative relationships with other professional organizations, provider groups, political and lay organizations concerned with the health care of older persons. Dr. Ahuja succeeds Fred Rubin, MD, who was a founding member of the Society and who served as president of the PAGS-WD since 2010. Dr. Rubin also was an elected officer of the Society when its members met for the first time on January 29, 1991. During Dr. Rubin’s term, the society has seen consistent growth in membership. He was instrumental in offering a new educational program called Controversies in Geriatric Medicine, now in its fourth year. The Society has been recognized by the AGS and awarded the State Affiliate Achievement Award for Innovative Programming, an honor bestowed upon the society on three separate occasions, two of which when Dr. Rubin was serving as president. Dr. Ahuja and the Board of Directors are dedicated to building upon the success that Dr. Rubin established during his tenure and to fulfill the mission of the society, which has remained the same for nearly 30 years. Dr. Ahuja earned her medical degree from Seth G.S. Medical College and KEM Hospital in her native country of India in 1994. She came to the United States the following year and completed her internal medicine residency at Methodist University Hospital of Memphis, TN in 1999, serving as chief resident for one-year. During her residency, Dr. Ahuja developed an interest in geriatric medicine. 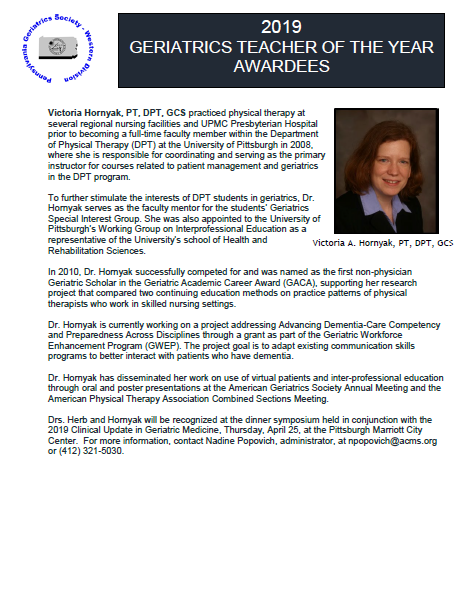 She completed a fellowship in geriatric medicine at the University of Pittsburgh Medical Center in 2005 and has practiced within the University of Pittsburgh’s Division of Geriatrics since that time. Dr. Ahuja currently serves as senior medical director, Medicare and Geriatric Programs, UPMC Health Plan. 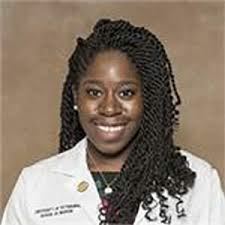 She is also a clinical assistant professor, Division of Geriatric Medicine, University of Pittsburgh School of Medicine. Board certified in geriatric medicine, Dr. Ahuja maintains certification in Hospice and Palliative Care, in addition to seeing patients in a nursing home clinic. 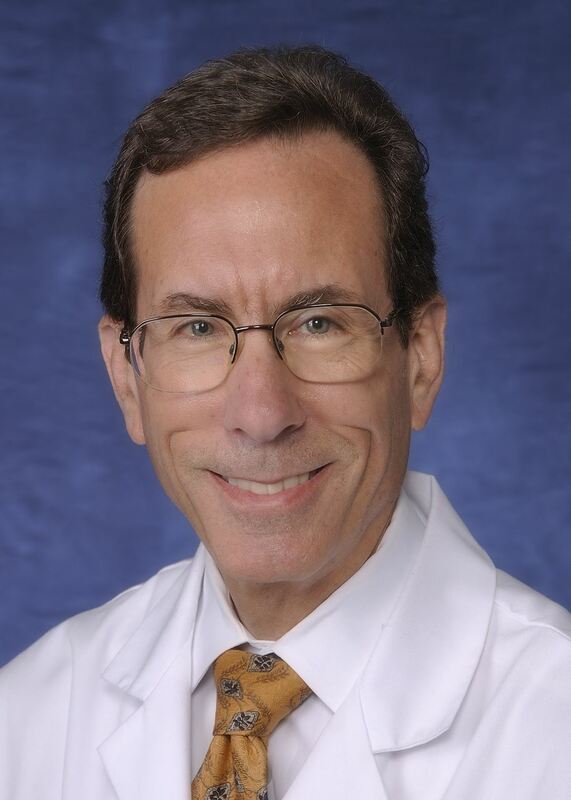 The American Geriatrics Society (AGS) announced that Neil M. Resnick, MD, AGSF will be the next Co-Chair for its Council of State Affiliate Representatives (COSAR). Dr. Resnick is Thomas Detre Professor of Medicine and Chief of Geriatric Medicine at the University of Pittsburgh and UPMC. 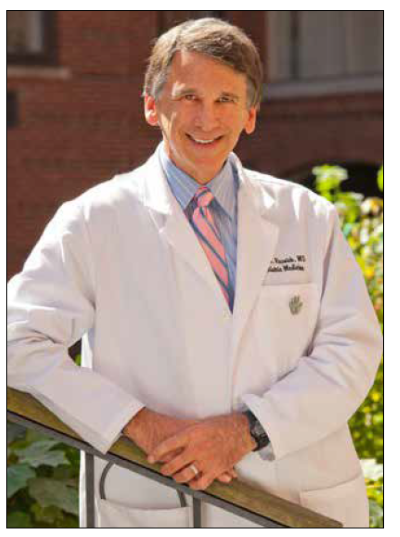 Dr. Resnick brings a wealth of leadership and knowledge to the role. His experience includes 15 years as a Board member and COSAR representative for the Pennsylvania Geriatrics Society Western Division (PAGSWD). PAGSWD is a three-time winner of the State Affiliate Achievement Award, including in 2018. Dr. Resnick has also been active in AGS, having won its Outstanding Excellence Award for Research in 2004 and having served as an AGS Leadership Scholar, a member of 3 AGS committees, and a mentor in its national mentorship program. 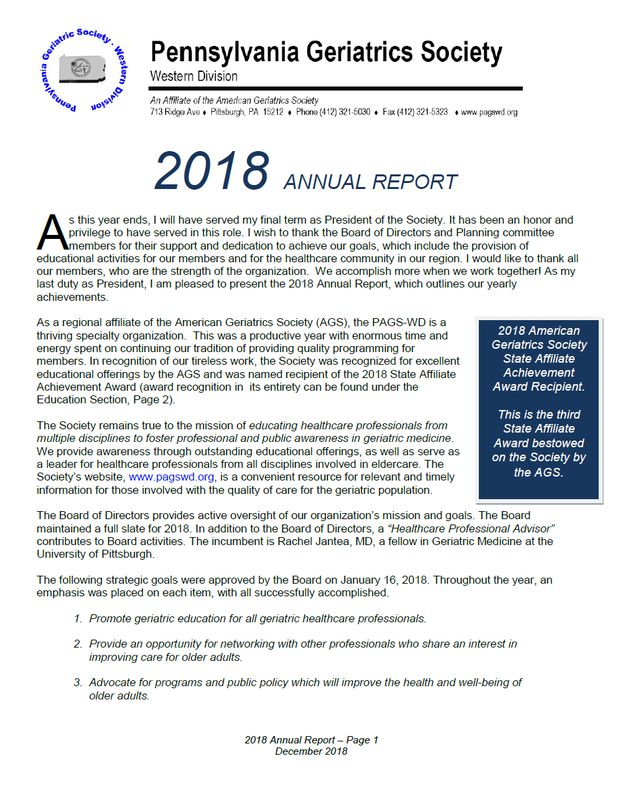 Dr. Resnick is excited by his new role as he believes that State affiliates should serve the national organization in two ways: by providing AGS with information from the trenches regarding practitioners insights and priorities and by serving as AGS’ implementation arm for its education and policy initiatives. He plans to use a team approach to learn from each affiliate’s success and challenges and to identify ways to increase the value of each affiliate. His hope is to help increase the number and membership of affiliates. He will assume his new position after the American Geriatrics Society national meeting in May, 2019. COSAR, the governing body of the AGS State Affiliates is recognized as an important, deliberative body to promote and support affiliates. It is consists of elected member representatives, one from each of the proposed, provisional and active State Affiliates. It meets regularly to exchange information on State Affiliate activities, and to share new ideas on development, advocacy, education, membership, public policy and other affiliate business. 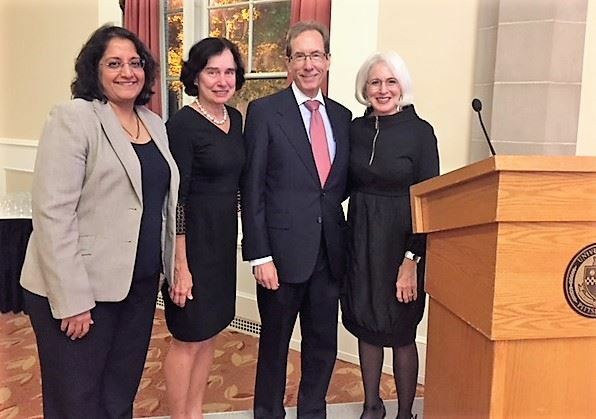 The Pennsylvania Geriatrics Society – Western Division (PAGS-WD) held their annual fall program on Thursday, November 1 at the University Club in Pittsburgh. Over 50 internists, family practitioners, geriatricians, pharmacists, nurses, nursing home administrators, and social workers attended the evening dinner program. 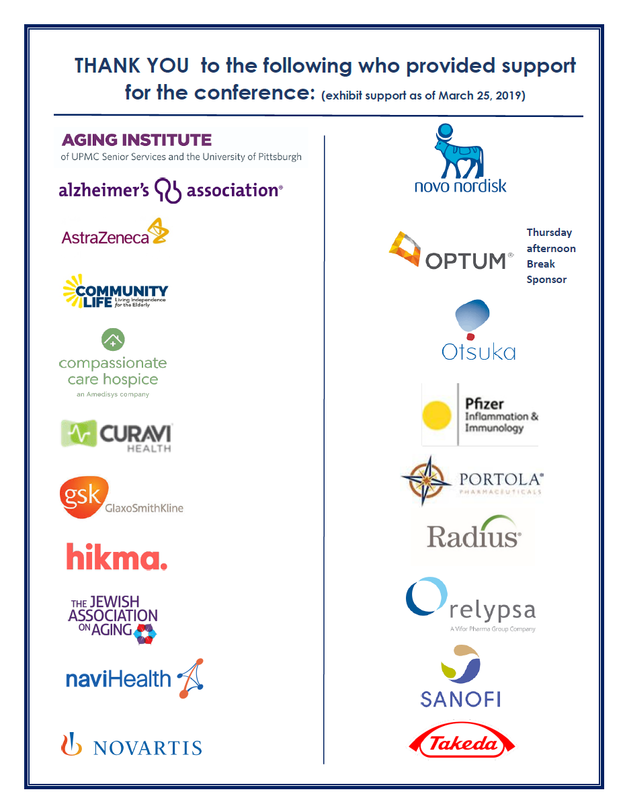 Thank you to the following who provided support: Aspire Healthcare, Astellas, CommunityLIFE, naviHealth, Optum, Portola Pharmaceuticals, Presbyterian SeniorCare Network and Valeritas. The audience welcomed Karen Wolk Feinstein, PhD, President and Chief Executive Officer of the Jewish Healthcare Foundation (JHF) and its three operating arms, The Pittsburgh Regional Health Initiative (PRHI), Health Careers Futures (HCF), and the Women’s Health Activist Movement Global (WHAMglobal). Dr. Feinstein presented Living a Good Life – Not Just a Long One, which explored the challenges to find new meaning and purpose in life as we age. Her discussion delved into the roles that define adult years – doting parent, accomplished professional and weekend warrior athlete and the changes that occur when they start to fade. Dr. Feinstein presented that a growing body of research suggests that finding renewed purpose later in life can, quite literally, be a life-saver. Seniors who have a clear sense of purpose in their lives tend to have better physician, mental and even spiritual health compared to those who do not. The annual fall program, which began in 2003, is a popular and well-respected program attracting distinguished guest speakers, comprised of both national and local faculty. For more information on becoming a member of the Society, please visit www.pagswd.org. Members receive complimentary registration for many programs hosted by the Society. Questions may be directed be directed to Nadine Popovich, administrator by email to: npopovich@acms.org or to (412) 321-5030. 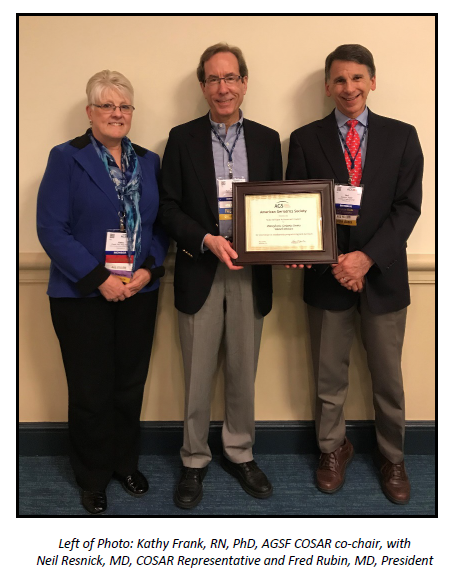 The American Geriatrics Society (AGS) awarded the Pennsylvania Geriatrics Society – Western Division (PAGS-WD) with its 2018 AGS State Affiliate Achievement Award for Innovative Educational programming. This prestigious award is given to an AGS state affiliate who has successfully achieved continued growth of educational programs. 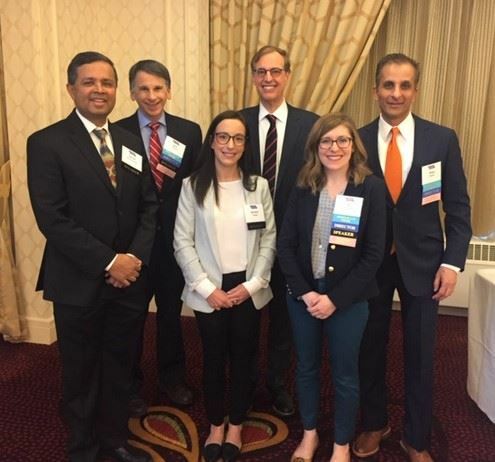 The Society was recognized for the Clinical Update in Geriatric Medicine Conference (the largest CME event in the region), the Controversies in Geriatric Medicine (June) Program, and the annual Fall Program. The David C. Martin Award (DCM), the Society’s student scholarship program, was also highlighted. A portion of the profits from the educational series sustains the DCM honorariums that are awarded to recipients. Honorariums are used by awardees to offset the costs of attending the AGS national conference where they have the opportunity to display their work. Neil Resnick, MD, COSAR Representative, and Fred Rubin, MD, President, accepted the award on behalf of the Society at the AGS Awards Ceremony, held in conjunction with the AGS national meeting on May 3-5, 2018 in Orlando, FL. Dr. Resnick was also invited to speak at a separate AGS State Affiliate Chapter meeting. He presented highlights and implementation strategies on the Society’s award-winning programs. The valuable resources and tools shared served as a guideline for other state affiliates to create and implement programming in their respective region. In addition to being recognized at the AGS meeting, the Society received an honorarium of $1,500. This is the third honor bestowed on the Society. In 2003, the AGS awarded the State Affiliate Achievement Award in the area of continuing education for members to the organization, specifically, the overwhelming success of the Clinical Update in Geriatric Medicine conference. In 2011, the Society was honored for their accomplishments in membership recruitment and retention. 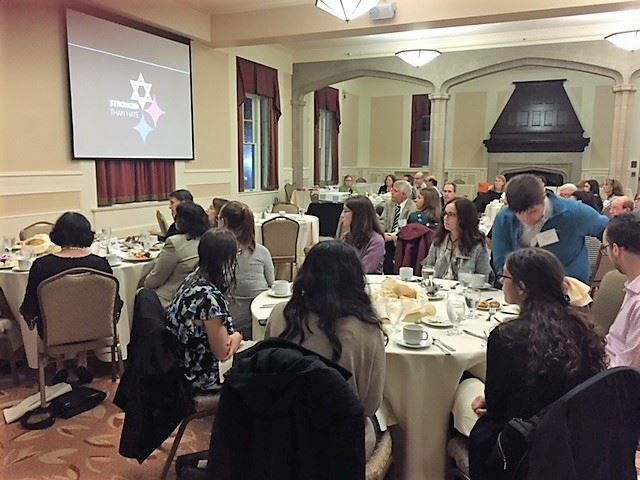 The Pennsylvania Geriatrics Society – Western Division welcomed attendees to the 4th annual Controversies in Geriatric Medicine program held June 19th at the Herberman Conference Center, Pittsburgh, PA. The program was made possible with sponsorship from: MedstartTM , naviHealth, Optum, Portolo Pharmaceuticals, and Sanofi Pasteur. Navigating Difficult Decisions presented the case of an 80-year old woman with diabetes and generalized atherosclerosis who underwent repair of a 5.7 cm AAA with an endovascular stent. She had a stormy post-operative course and spent the next 4 months in the hospital. Leading the Panel discussion was Nivedita Gunturi, MD, Fellow, Division of Geriatric Medicine, Department of Medicine, University of Pittsburgh, who presented the case, and stopped at various key points to elicit audience opinions. Jane Schell, MD, FNKF, Assistant Professor of Medicine, Section of Palliative Care and Medical Ethics, Division of Rental Electrolyte, University of Pittsburgh discussed the evaluation of decision-making capacity, the risks and benefits of hemodialysis in a frail elderly patient and the challenges of establishing goals of care when the patient had made no advance directive and family that disagree. A lively discussion from panelists and audience members concluded the presentation. Moderator for the evening was PAGS-WD President, Fred Rubin, MD. This is the fourth Controversies in Medicine program hosted by the Society and is a part of the yearly educational series, which was recently awarded the American Geriatrics Society State Affiliate Award for Innovative Educational Programs in Geriatrics. More than 380 geriatrics professionals from all disciplines, including physicians, n urses, pharmacists, physician assistants, social workers, long-term care and managed care providers, and health care administrators participated in the 26th Annual Clinical Update in Geriatric Medicine conference held at the Pittsburgh Marriott City Center Hotel April 5-7. The course attracted registrants from numerous states, including California, North Carolina, New York and Washington. conference continues to be a well-respected resource to educate healthcare professionals involved in the direct care of older persons by providing evidence-based solutions for common medical problems that afflict older adults daily and for which rapidly evolving research (much done in Pittsburgh) is revealing new approaches that are feasible for the real world. 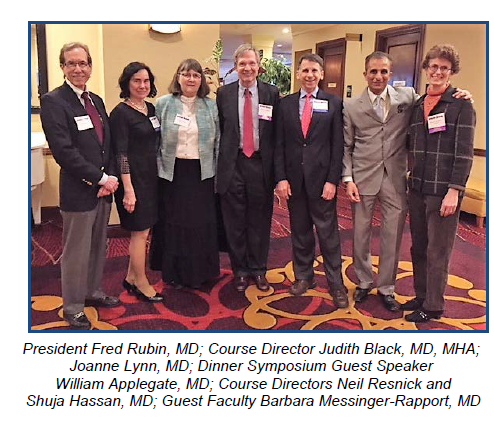 Under the leadership of course directors Shuja Hassan, MD, Judith S. Black, MD, MHA, and Neil M. Resnick, MD, who worked tirelessly with the planning committee, the course is a premier educational event in the region. The course attracts prominent international and national lecturers and nationally renowned local faculty. William Applegate, MD and Barbara Messinger-Rapport, MD comprised this year’s exceptional guest faculty. Nearly 40 state-of-the-art sessions taught by highly regarded clinician-educators and researchers were offered during the three-day event. Each lecture, symposium and breakout session offered participants evidence-based “pearls for practice” designed to be immediately incorporated into the realities of daily practice. 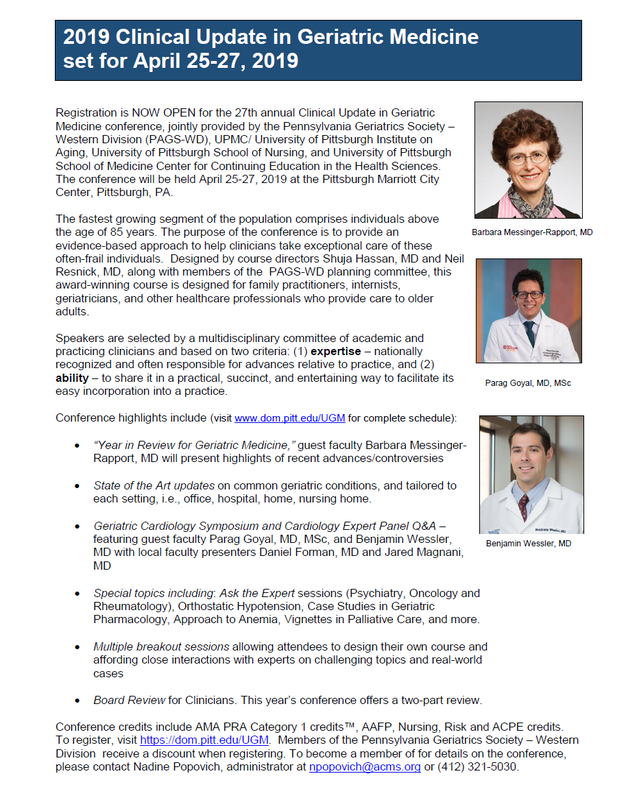 The conference is jointly sponsored by the Pennsylvania Geriatrics Society – Western Division; UPMC/University of Pittsburgh Aging Institute; and University of Pittsburgh School of Nursing, in partnership with the University of Pittsburgh School of Medicine Center for Continuing Education in the Health Sciences. 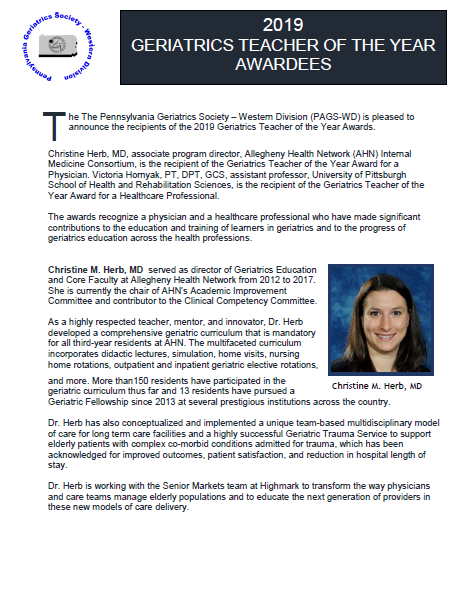 The 2018 Geriatrics Teacher of the Year Award presentation was held prior to the dinner symposium at the 26th Annual Clinical in Geriatric Medicine conference. 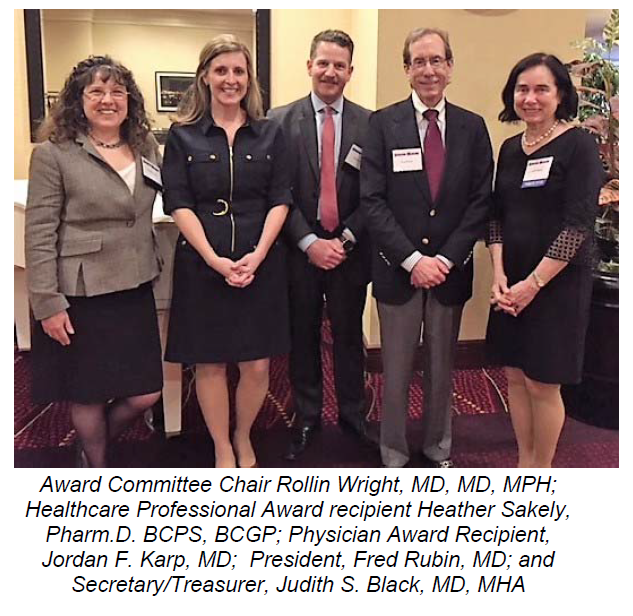 Jordan F. Karp, MD and Heather Sakely, Pharm.D., BCPS, BCGP were honored with a special recognition for their dedication and commitment to geriatrics education. Rollin Wright, MD, MS, MPH, awards chair, and Fred Rubin, MD, president, shared the podium to highlight the achievements and significant contributions each awardee has made to the education and training of learners in geriatrics and to the progress of geriatrics across the health professions. More than 65 attendees were on hand for the plaque presentation. Jordan F. Karp, MD received the 2018 Geriatrics Teacher of the Year Award, recognizing a physician. Dr. Karp has maintained a clinical practice of psychiatry since 2003, in which he focuses on the care of older adults and patients living with both psychiatric and chronic medical conditions, in particular, chronic pain. He has served as medical director for psychiatry at UPMC Pain Medicine at Centre Commons from 2006 to 2017, is the director of Student Mental Health Services at the University of Pittsburgh School of Medicine, serves as medical director for the UPMC LifeSolutions Employee Assistance Program, and is a staff physician at the VA Pittsburgh Medical Center. 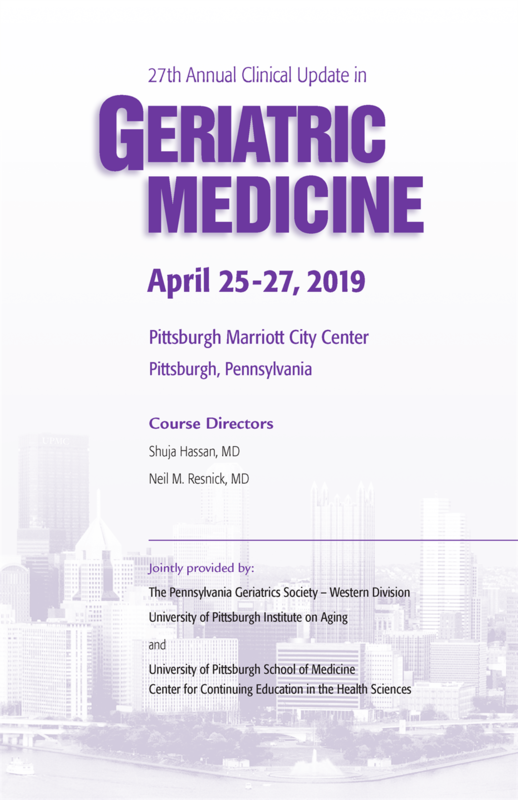 He is a prominent teacher, mentor, and researcher in geriatric psychiatry and has worked to help strengthen the relationships between the educational missions of the geriatric psychiatry and geriatric medicine training programs at the University of Pittsburgh Medical Center. 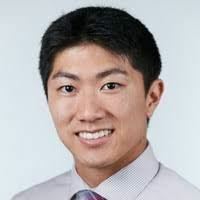 He has provided scholarly mentorship to 20 trainees and serves as a faculty mentor on the University of Pittsburgh NIH-funded training grant, "Clinical and Translational Research Training in Geriatric Mental Health." Heather A. Sakely, PharmD, BCPS, BCGP received the 2018 Healthcare Professional Geriatrics Teacher of the Year Award. of collaborating pharmacists and doctors in inpatient, outpatient, and long-term care settings. Dr. Sakely is faculty in the Family Medicine Residency Program and Geriatric Fellowship at UPMC St. Margaret and adjunct instructor at the University of Pittsburgh School of Pharmacy. Dr. Sakely complements her role as an educator with strong research experience. She has been principal investigator and leader of the PIVOTs research (Pharmacist-led Reduction of Drug Therapy Problems in an Interprofessional Geriatric Practice) since 2012, which has helped assess the impact of collaboration between pharmacists and doctors in nursing home, assisted living and independent living environment for seniors. A call for nominations for the 2019 Geriatrics Teacher of the Year award will begin in September 2018. Award eligibility, criteria and details will be available on the society website in August (www.pagswd.org). 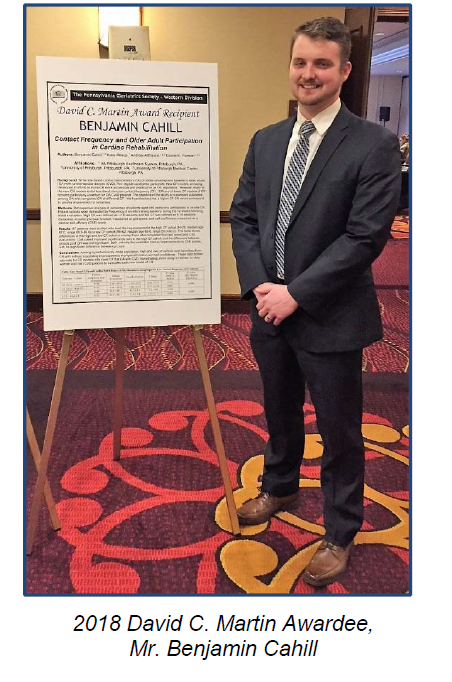 The Pennsylvania Geriatrics Society – Western Division is proud to announce the 2018 recipient of the David C. Martin Award: Mr. Benjamin Cahill, a medical student attending the University of Pittsburgh School of Medicine. Mr. Cahill was recognized at the 2018 Clinical Update in Geriatric Medicine dinner symposium, where he was presented with a certificate of excellence and honorarium. The honorarium will aid in defraying expenses to attend the 2018 Annual Scientific Meeting of the American Geriatrics Society conference, where he will present his abstract, Contact Frequency and Older Adult Participation in Cardiac Rehabilitation. The award was named after David C. Martin, MD, who established the first geriatrics fellowship in Pittsburgh, PA. The ultimate goal of this prestigious award is to encourage and prepare future physicians in the field of geriatric medicine. Since its inception, the Society is proud to have awarded over $81,000 to area medical students interested in the field of geriatric medicine. Connection: You are connected to a larger group banded together to produce positive results for geriatric health in our region. Conferences & Programs: We provide quality education and networking opportunities for geriatric health professionals, and members can attend at a reduced registration fee. Check out our events page for more information. Free Informational Services: The Society keep you in touch with your peers and current issues through the web site, newsletter and email updates of emerging issues relevant to geriatric health.